Investigators looking for a missing Brooklyn woman issued an update on their investigation today that shows little new information despite hours of searching and following up leads. 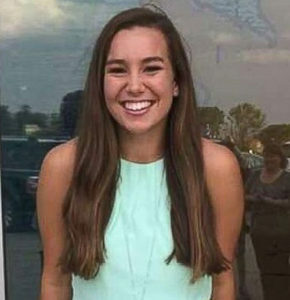 Tibbetts, who is a student at the University of Iowa, was reported missing by her family on July 19th. She was last seen on July 18th at approximately 7:30 p.m. while running the streets of Brooklyn. She was believed to be wearing dark colored running shorts, a pink sports top and running shoes. Rahn says while they are getting tips called in, they are also just following through on normal leads. He says it is typical in any investigation that when they interview one person, that leads to two or three more interviews and lead. “We are trying to drill down as much as we can — and like I said before — trying to do our best to locate Mollie,” Rahn says. Tibbetts was know to wear a Fitbit while running and Rahn says that is just one of the things they’ve been looking into. “I know that there’s been a lot of information discussed about the Fitbit — and that’s just one additional tool that we are trying to access. And one additional lead, however you want to say it, that we are trying to use to again get here whereabouts or location,” according to Rahn. “We commonly will look into cellphones, computers, any electronic devices. In this particular case it just happens to be a Fitbit.” Two hog farms near Guernsey in Poweshiek County were searched this week. Those farms are about 10 miles from Brooklyn. Rahn was asked how they characterize the investigation a little more than one week after Tibbetts disappeared. “Well, certainly a missing person. And uh, certainly suspicious,” Rahn says. “and so I don’t know if we can label it one way or the other. “We’re are continuing on with the investigation just as we did from day one.” The case has gained national attention and Brooklyn residents have been putting out posters and buttons and cards asking for help in finding Tibbetts. Anyone with information is asked to call the Poweshiek County Sheriff’s Office at 641-623-5679, or email the Poweshiek County Sheriff’s office at: tips@poweshieckcosheriff.com. The FBI is helping the Iowa DCI with the investigation along with county and local law enforcement.